Hands-on solutions with reusable code examples and step-by-step recipes that will guide the reader to success. 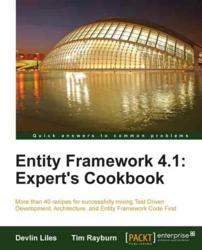 Entity Framework 4.1: Expert’s Cookbook: Published! Entity Framework 4.1 Expert Cookbook- Entity Framework 4.1 allows us to dive into the world of data access without having to write SQL statements. Packt is pleased to announce the release of Entity Framework 4.1: Expert’s Cookbook, a new book and e-book that guides users through critical technical decisions to avoid technical landmines. Written by Devlin Liles and Tim Rayburn, this cookbook would not only guide .Net Developers on using Entity Framework but also enhance the data access wizard. Entity Framework is a component of the .NET Framework and a set of technologies in ADO.NET. The developers can work with data in the form of domain-specific objects and properties at a higher level of abstraction, create and maintain data-oriented applications with less code. Entity Framework 4.1: Expert’s Cookbook provides users with examples that will lead through vital features such as reusability, integration with other technologies, architectural management, complex mapping scenarios and query definition. Furthermore, this book provides concrete code examples as well as detailed information on the decisions involved. Using this book, developers will learn the benefits of creating and seed testing databases from code that manages database queries and leverage the full power of LINQ. Additionally, this book will also dive into designing an extensible data access layer and use stored procedures without losing the power of object oriented development and create clean integration tests. All Entity books are Published by Packt Enterprise. Packt Enterprise is a publishing division of Packt Publishing designed to serve the information needs of IT Professionals in the Enterprise space. Packt Enterprise also publishes on Microsoft, IBM, Oracle, Citrix, Java, Amazon, Google and SAP technologies.